A very big thank you to you and your staff for another wonderful Christmas Lunch. Everyone really enjoyed it. See you next year !!!! Cheers and a Very Merry Christmas to you. On behalf of AutismBC, it is my distinct pleasure to inform you that your organization has been nominated for a 2018 BC Excellence in Autism Award in the business category. Please find attached a congratulatory letter from our President, Laurie Guerra. These awards celebrate the achievements of people and organizations who enhance the lives of individuals affected by autism across the province. The awards recognize and celebrate the incredible contributions of professionals, self-advocates, volunteers and businesses working towards an inclusive society where people on the autism spectrum can reach their full potential. We would like to acknowledge your good work in the autism community and recognize your efforts. Over the next few weeks, our selection committee comprised up of leaders in community will review the nominations and making selections. Sort listed nominees will be invited to attend the awards dinner to held at the Pacific Autism Family Center in Richmond BC April 20th. keep up the great work! it's hard to believe how far we have come since the first meeting just over a year ago, looking how we could bring a breakfast program to Langley SS, and what a positive year we have had in our first full year of the program. Thank you for your tireless efforts in making sure our students are well fed and ready to learn. I was very excited to receive the Canuel Caterers/Vendmaster Scholarship, your generous support to our gradutating students helps us greatly as we take the first step on our post secondary journey. I am writing to express my sincere gratitude to you for making the $500 Canuel Caterers/Vendmasters Scholarship possible, and in doing so have lightened my financial burden which allows me to focus more on the most important aspect of school, learning. Your generousity has inspired me to help others and give back to the community. I hope one day I will be able to help students acheive their goals just as you have helped me. Dear Mr. Canuel, I would like to express my sincerest gratitude for the Canuel Caterers/Vendmaster Scholarship. i am looking forward to putting it towards my goal of completing the Commerce and Business Studies Program at Langara College starting this fall. On behalf of the Coquitlam Senior "A" Adanacs Lacrosse club, we would like to take this opportunity to say THANK YOU for all your continued support! Without people and businesses like you senior Lacrosse could not exist, and we cannot tell you how much we appriciate all you do for us. Support from our Sponsors makes up over 60% of our revenue. Again, thank you for all your efforts and for helping us support these young men in achieving their goals. It would not be possible without you! I had the pleasure to be at Prince of Wales Secondary school for two days last week and two days this week on training. Each of those 4 days I chose to purchase my lunch at the cafeteria. I wanted to let you know how impressed I was by the staff and the food. The staff were friendly, knowledgeable, and very accomodating. I was so impressed that I asked who I could send a commendation to and I was given your e-mail. I would like to especially highlight Cora, the cook. All the food was delicious, but her chicken curry was outstanding. It would be a dish I would gladly eat in any fine restaurant. School cafeteria food is often seen as bland and unnutricious. This cannot be said for PW. The food was very flavourful, healthy, and fresh. Kudos the whole team at PW. 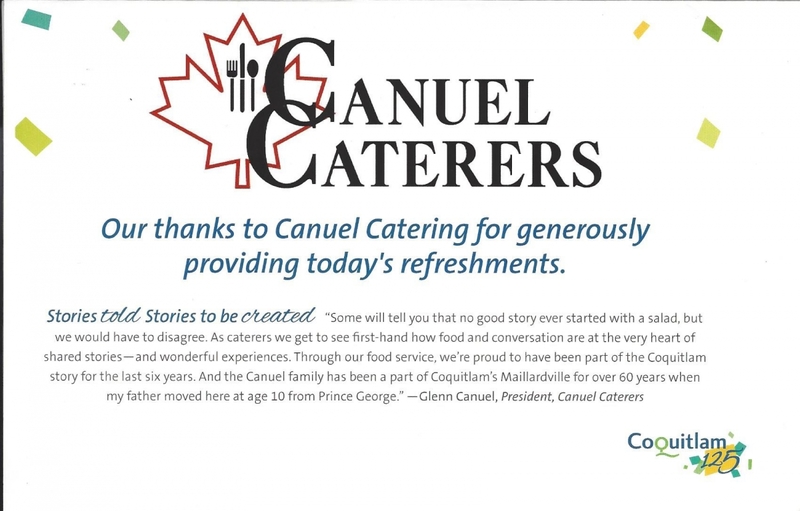 We thank Caneuel Caterers for sharing the insight and expertise of their staff with our students as they prepare for the challenges of the future workplace. Thank you so much for this wonderful scholarship. To be honest, I am at a loss for words, as I begin describe my overwhelming gratiude. This scholarship has provided me with some much needed financial aid and it will go towards my tuition and other similar expenses, as I continue my education at SFU. By providing me with this scholarship, you have not only provided me with financial aid, but ou have also validated my journey of seeking a post-secondary education. So thank ou, thank you very much! I just wanted to tell you how much we appreciated Canuel last night. The food was great and Lisa, Sharron, and Jeffrey were an amazing serving team. Could you pass that along to them? On behalf of the UBC Thunderbirds Sport Clubs Staff and Athletes, I cannot thank you enough for your catering services at our Awards Banquet this week. You and your team were absolutely fantastic and very accommodating in all aspects of our event. We really appreciate how efficiently everyone was served at the buffet, and the quick clean up time which allowed the programming of our event to be very smooth and timely. As well, from what I’ve heard, everyone loved the food! Please let us know what the best way to leave you a positive review would be so that others can learn about your great service. I’d be happy to do so. Thanks again, we will definitely be passing on our recommendations for Canuel Caterers to anyone in need! 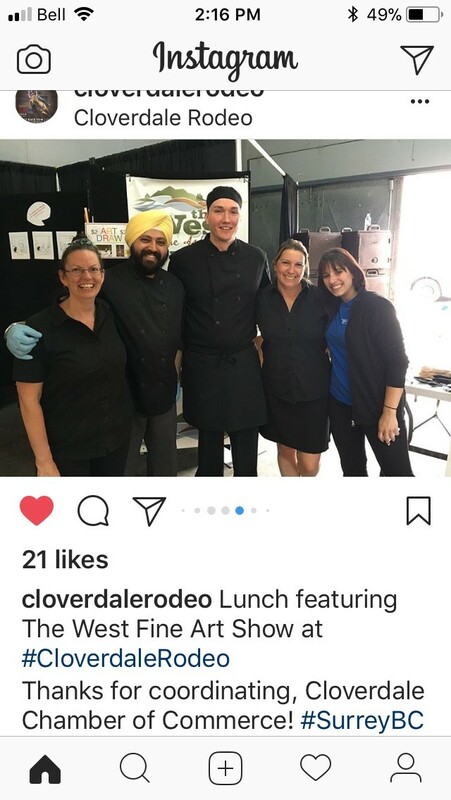 I just want to thank you so much for the incredible lunch your team put on at Heritage Woods Secondary school last Thursday. The teachers, admin and support staff were incredibly appreciative! They really enjoyed the delicious skewers of chicken and the incredible Greek salad and sides!! Dani and Alison were so accommodating and helpful!!! They know how to run the show!! Lastly, big thanks to you, Kim, for helping me organize this amazing luncheon and helping me with all the little details that go into a successful event! I'm sure will be working together in the future! Thank you so much for helping organize the catering and snacks for our meetings this week with the TCCA. Everyone commented on how fantastic the lunches and snacks were. Nobody left hungry and the afternoon fresh cookies were a hit. Thank you again for all your support in making this happen. Thanks again for making last evening’s event look so easy. Your team is so amazing! Everyone thoroughly enjoyed their meals and our new district administrators were so impressed that we could serve over 850 dinners in such a short time. just want to thank you for the fantastic job you and your crew did! And a big thank you for Dave, had so many compliments on all the food! I thought you handled everything perfectly; I had confidence in you and your crew! Thank you again for the wonderful job!!!! On behalf of the welcome back BBQ team, I would like to extend our thanks for a job well done. Kathy and her team did an amazing job, not to mention the food was excellent. Please extend our thanks to your team. We were all impressed with the professional and timely manner in which Canuel conducted the evening. Once again, thank you Kim. First, would like to thank you for all your help. You made this so easy for us. Your staff were absolutely fantastic and efficient. Everyone loved the food, it was delicious and the set up looked beautiful. Many asked which company was catering (there will be a few weddings coming up), we made sure they knew your name. I just wanted to let you know that we appreciated all the work you and your team did. I believe that people don't always receive the appreciation they deserve so are you able to give your chef, cooks and staff a big thank you on our behalf? Just wanted to thank you, Chef and all your team for the wonderful food and service for our Honouring Ceremony on Monday night. As always you are so professional and the food was amazing!!! Chef’s creations were a big hit!!! We’re very appreciative of all the effort that was put into our event. Kudos to everyone. Hope each of you get a well-deserved rest! " I just wanted to thank you and your team for once again giving us a wonderful meal with great service. We had lots of food, and nothing but compliments. Please pass this on to all the people involved. It is so seldom that people say thanks, one usually hears from customers to complain, and this is certainly not the case. So again, thank you and we will keep calling you for any events. " The lunch today was fabulous. Actually, outstanding. Everything tasted so good and event went very smoothly. Your team is fantastic and deserve extra kudos for going above and even more. Couldn’t have done this without your help….thanks again for being part of our office lunch. "First of all I would like to thank you for the Canuel Caterers' scholarship. My name is Timothy Leung and I am a graduating student at McMath Secondary school. Next year I will be attending UBC in the Faculty of Sciences and will use the scholarship towards my tuition. I aspire to become a pharmacist and this scholarship will help me tremendously with the expensive tuition. Thank you again for your support and I am honored to receive this scholarship. P.S. I love your perogies. "Thank you very much for your donation to our pub night fundraiser. With support like yours our team was able to raise over $5,000 to contribute to the Relay for Life's grand total of over $60,000. On behalf of the Canadian Cancer Society and the Cascades Crusaders thank you again." “Hello, Kim, I would like to use this opportunity to thank your team: Kathy and Karen and other catering staff. We enjoyed their service, enthusiasm, and, of course, food! We would love to work with you again next year." "On behalf of Region 6 sincere thank you for all you did“ to create such an incredible games. Everyone constantly went above and beyond and it was so noted and appreciated. The Games created wonderful memories we will all carry with us as we move forward with our Special Olympics journey. The experience empowered us, allowed us to celebrate our victories, and the victories of others, and in doing so shine! Thank you for the commitment, skill and passion you brought to the Games; they were truly an experience we will not forget. All the best. " "The event was excellent. Your team was fabulous and obviously the food was good because we had nex to nothing left." "Thank you for all your hard workon last night's event. Everyone we spoke to really enjoyed the dinner. It was nice that some of our staff was able to join the feast as well." "I would like to thank you for the excellent service! The food was excellent and you and Debbie were very accommodating and a pleasure to deal with. I would be happy to use Canuel Caterers again in the future. " "Thanks again for great food and great service. Everyone said how much they enjoyed it and how efficient the staff was. There were no waits and the food was just right. That is why we want you to make sure you put us on your calendar for about the same time next year. Thanks again and hope you and your staff have a great holidays with family." Just wanted to let you know that everything was lovely!! Debbie and all the staff were so helpful and we had many compliments on the food, bar service and the service in general. My dad was thrilled with the venue and all the trimmings! Thanks again for all your help and we will certainly recommend Occasions by Canuel Caterers to our friends and family - & of course we would not hesitate to call on you again! "We had a perfect wedding day; everybody has told us it was the best wedding they've been too. It was a day we will never forget. Thank you to you and your staff for hosting! I can't thank you enough. We will definitely recommend the venue and the catering to others! Any other events we host will definitely be at that site. I wanted to say how much I appreciated Canuel's service this week. From trying to plan with numbers that were unreliable at best to reacting to the needs day to day, your team was outstanding. And best of all I received a lot of compliments on the quality of the food which I wanted to pass on to you. The volunteers thought the food was delicious and it became a point of discussion where volunteers were encouraging others to go check it out because it was so goo. I've never seen that kind of response before. I've passed on these comments to Dan Howe as well and I won't hesitate to recommend you for future work. "Our recreation complex experiences over 1.25 million visitors per year and Canuel has consistently delivered in providing quality food services during that time. We have found their staff to be extremely professional and accommodating no matter how big or small the event may be and regardless, the same level of service can be expected." "It was a big decision for our school to change cafeteria contractors, We have been nothing but pleased with our decision. Canuel Caterers have been exceptional."